I've been barefoot since the spring of 1983, when I came - unshod - from my mother's womb. After many years of various footwear choices (including a sweet Donald Duck full-body onesie that I wore as a babe) I found myself pounding the streets and trails in the likes of Nike and Asiscs. I had joined the cross-country team during my junior year of high school, slowly becoming familiar with the technical aspects of the sport - which had been the dreaded punishment when I played other sports. I ran for two years, and when I crossed the line at my last high school meet, I didn't run again for another calender year. I was proud of that...because I'd grown tired of running. Throughout college, I ran. To class. Around the track. A couple 5k races. But it wasn't affectionate. I was running because fit people run...and because I'd done so in the past. That attitude carried-over through grad school and into a move to Orlando - that I'd run to stay in shape, but that my affinity for it could be occasionally described as 'like', but usually just 'tolerance'. Then, lightning struck (not literally, though I have been buzzed by lightning...crazy story for another time). I bought a pair of Vibram Fivefingers. 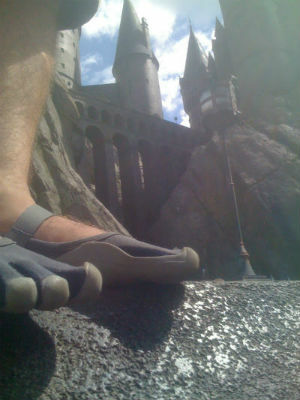 Toe shoes. Gorilla feet. Blue toes. Frog feet. You name it. I bought those things. And they did something for me that no other shoe had ever done. They got the hell out of my way. Every shoe had coddled and "protected" my feet - thus leaving them in a jail-like prison where the proper muscles weren't able to engage all on the same level as others in the foot. When I started wearing the Fivefinger Sprints, my gait changed - landing on my forefoot: my posture increased, impact force lessened, and feel for the ground went up exponentially. My feet were becoming whole again. Muscles in the top (dorsal) were coming alive. My ankles - recently weakened by repeated ankle sprains - grew stronger and more durable. My arch support began coming from...wait for it...the arch muscles in the bottom (plantar) of my foot. This is not revolutionary. It's simply real. When my feet strengthened...so did the sensory receptivity of the nerve endings in the bottom of my feet. The result? Higher agility. Better balance. Increased proprioception. Once my calves (finally) caught up - there was no stopping me. [Note: this doesn't necessarily happen with everyone, per se - but I can vouch that it has happened for me…indubitably]. But most importantly, running became fun again. You didn't have to force me to run. I wasn't running simply to get better - like before, during and after school for training. I was running because it felt good, and it was unequivocally...fun. 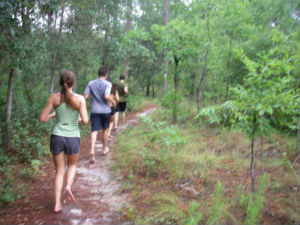 The detractors of barefoot and minimalist running point only to the propensity for injuries that new runners sometimes have and decry the shoes (and the feet) for teaching incorrect technique. But is it possible that people are just getting injured because some of their foot muscles are so weak - it's like they need to get re-birthed again? That when they began to regain their flexibility/strength, their owners cannot contain how enjoyable it is to get out of the house and put to use their bodies - how they were designed to be used? I think this is most likely the case, that people frequently - and quickly - overwork their baby-like muscles. Injuries are more derived from man-made footwear. Forty years ago - an intelligent man made some assumptions about running that were (in my opinion) just not correct enough. From that came the modern running movement. The one that sees most (if not all) of its most talented adherents regularly injured or tip-toeing around injuries. Conversely - barefoot is not scary, as it may seem. It is empowering. My feet are stronger, the pads more durable, the muscles more versatile. They help my body feel more alive. Barefoot is not about fads. It's about getting as close as possible to the way God made feet in the first place. Which means shoeless as much as possible...and if that's not possible; Vibram, Merrell, Vivo, Luna, Terra Plana - whichever. Now, I go almost everywhere barefoot. The park, the beach, around the house, in the car, to climb trees, to mow the lawn (just kidding Dad), everywhere. It took some time, but I finally made my way back to loving being barefoot. 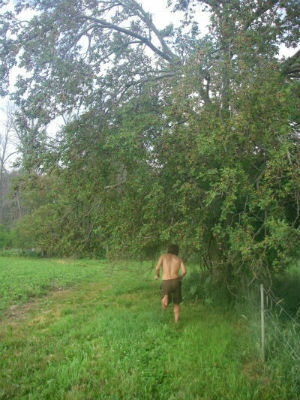 I hope you take some time to ponder barefoot and minimalist, running - youmay just love it too.